If I don't have my prescription, can you get it from my doctor? What does it mean if by Cylinder the doctor wrote Sphere or DS? Do all prescriptions have Axis and/or Cylinder? Which number(s) do I enter as the PD? Does PD affect the actual frame size? What lenses do you offer? Are the lenses covered under warranty? Is the frame still covered under warranty once a prescription has been filled? How can I order Plano lenses? If I order a rimless frame, would you be able to change the size or shape of the lens? What is the difference between the Anti Glare upgrades? Why don't I see �Tinting options� when I choose �Polycarbonate Lenses�? If I chose sunglasses is tinting or polarization included with the prescription? I am wondering if it is risky to buy prescription glasses online. Isn't it easier for a mistake to be made? Your Rx prescription is divided under the headings OD and OS. They are Latin abbreviations for Ocular Dexter, meaning right eye, and Ocular Sinister, meaning left eye. The first number is the Sphere. It is the basic correction for nearsightedness or farsightedness. It should have either a plus or minus sign or PL for Plano (or zero). For people with Astigmatism, the prescription details the Sphere, Cylinder (either negative or positive), and Axis. Having an Add in the prescription indicates that the doctor found a correction for Distance and Reading. This would mean ordering a bifocal/progressive lens or 2 separate pairs of glasses (for distance and reading). Doctors do not have to provide the information to us. They do however have to release it to you. It is best that you ask your doctor for a copy of your prescription. It means that you need no correction for Cylinder or Axis and you should enter by these None. No. Cylinder and Axis go together. You either have both or none. Pupil Distance, the distance between your pupils measured in millimeters. Ask your eye doctor or local optician to measure it for you. It will only take a couple of minutes. You can also do it on your own using our Online Pupil Meter. You have either been given Distance/Near, which would number between 55 and 75, enter the first number for a Distance prescription. Enter the second number for a Reading prescription. Some doctors may provide the Right and Left Eye written as a single digit. Double the number for the Distance PD. Or you have been given Right and Left Eye, which would number between 27.5 and 37.5, in this case you would just add the numbers together for the Distance PD. You have either been given Distance/Near, which would number between 55 and 75, enter the Distance and the Near. Or you have been given Right and Left Eye, which would number between 27.5 and 37.5, in this case you would just add the numbers together for the Far PD. Some doctors may provide the Right and Left Eye written as a single digit. Double the numbers for the Far PD. Does my PD ever change or can I use the same I had in my previous glasses? The PD does not change in adults. Children should be measured again with each new prescription. No, the PD just allows us to center the lenses properly in whatever frame you choose. Single Vision, Bifocals, and Progressive Lenses. Materials are plastic, polycarbonate, or high index materials with an assortment of add-ons to choose from. All the glasses are guaranteed to be filled according to the information provided. However, if the lenses need to be replaced within a year, with the original specifications, a discount will be given. Yes! The frame will still be covered under warranty for manufacturer's defects. Plano is simple optical language for zero. If this is part of your prescription or you just want lenses made out of optical quality material, select zero or none. We can change the lens to the size you specify. We can also change the lens shape, if you have a pattern for the lab to go by. The higher the upgrade, the better is the technology. That results to a better lens, more scratch resistant, and easier to clean. Some sunglasses look good as an eyeglass frame. For tinting or polarization there is an additional charge. Our opticians process the orders just like in a store. If there are any question about the order the customer is contacted. All frames are checked before and after the lenses are made. So the answer is no! 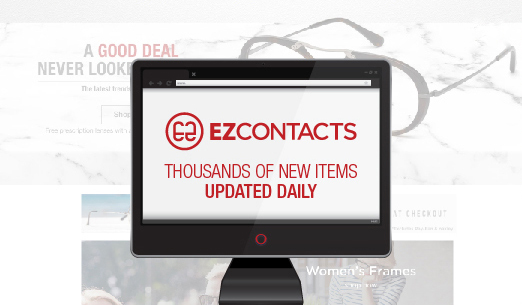 EZCONTACTS.com is as safe as going to your local optician down the street.